Construction of this cathedral in Salisbury Water Meadows began in 1220, replacing the Norman-era cathedral at Old Salisbury. Built under the supervision of master mason Nicholas of Ely, it was finished in just 50 years - a remarkable feat. The church's most distinctive features are its height and narrowness, which make it an exemplar of the Early English architectural style. This view shows its soaring interior supported by slender columns. 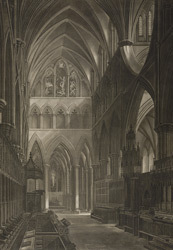 Writing in the 1720s, Daniel Defoe declared himself impressed by the exterior, but commented: "They tell us, this church was 40 years a building and cost an immense sum of money, but it must be acknowledged that the inside of the work is not answerable in the decoration of things, to the workmanship without; the painting in the choir is mean and more like the ordinary method of common drawing room, or tavern painting than that of a church."